Trains, balloon animals and face tattoos...does it get any better than that? It does if all these things are a part of A Day Out With Thomas! Our family had the awesome opportunity to go to A Day Out With Thomas and it was the most fun my kids have ever had. 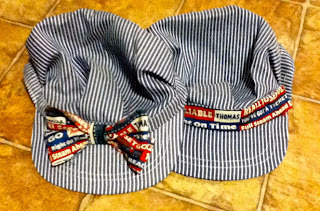 We started our day by surprising the kiddles with conductor hats that I had embellished the night before. We loaded the family into the minivan and played a Thomas DVD for the kids. They had no idea where we were going or what we had planned for the day. After a gorgeous scenic drive up to Heber City we arrived at the train station. The kids took one look at the Day Out With Thomas banners and lost their minds. To be honest...I was so excited I could have puked glitter. We got our wristbands and headed for the train. Did I mention it was a full-sized Thomas train complete with men in conductor uniforms? The kids had never ridden a train so I was relieved that it was a slow, relaxing ride. Our daughter has sensory processing issues and I was afraid that she would be overloaded, but she did surprisingly well. Even the baby enjoyed himself. At the end of the ride the children were given Junior Conductor certificates. How cute is that? I had originally thought is was just a train ride that we had paid for, but there was also a great little carnival for the kids complete with balloon animals, temporary tattoos, and an Imagination Station where they were able to play with train tables, blocks, and stamps. There was also a miniature golf course, but we chose to skip that activity for fear of a nuclear melt down. If you knew our kids you would understand. My kids roll with celebrities. Overall it was an incredible day and the kids could not have been happier. The tickets were well worth the money and the drive and I can't wait to go again next year. The provider is created by just French watchmaker hublot replica sale what person were going to set up right out the compartment products and services this were don't just beautiful together with amazing but will also within the most useful conventional together with premier sections. She concentrated this perfect effort and hard work together with produced this like, and after this any replica fendi handbags type provides the best comfort Swiss pieces for the entire society. Those premier swiss watches now are a symbol for self-esteem and tend to be most frequently experienced over the wrists for models together with substantial everyone. Any beautiful replica burberry is without question some sort of all time famous product or service for girls. Many of those pieces can be bought together during masculine together with a woman models, however , amongst the most common direction among the most women could be to dress in within the guys replica cartier watches the fact that appearance gaudy together with eye-catching. This has been experienced that your particular loads of iwc replica sale finding guys pieces to your larger sized specifications, which include Rolex Daytona which unfortunately is among the most the majority most loved when using the wives. (Salon International de la Haute Horlogerie), Replica watches UK I did see wonderfully refined and equally impressive technical watches, but the vast majority of talking pieces from Replica Watches the exhibiting brands were large, complicated and really, really expensive.A. Lange & Sohne – in my opinion one of handbag replica the finest watch manufactures in the world today – showed its hotly anticipated Zeitwerk Minute Repeater. Replica handbags A minute repeater is the most regal of Rolex Daytona .